A few weeks ago Portland author Gabriel Boehmer emailed me about Portland’s poetry posts. Gabe wrote a book called City of Readers: The Book Lover's Guide to Portland and is tuned into Oregon poets and writers the same way I tune in to manhole covers and urban staircases. A poetry post (or poetry pole or poetry box) is a wooden pole, usually, mounted on private property, so that it faces pedestrians. On top of the pole is a box, with a glass or clear face and a lid. Inside the box is a sheet of paper containing a poem (or, sometimes, prose or a photograph). Sometimes the pole is absent, the box mounted to a tree. That’s it. 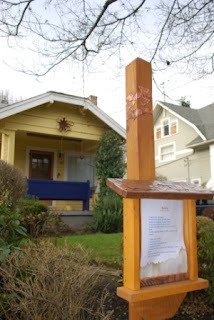 Gabe and I went on a poetry post tour of his Grant Park neighborhood and passed a poem on NE 36th Avenue. “My daughter and I pass this post every day on our way to Grant Park. She wants to stop and read the poem so we always do.” She’s four; she’s reading poetry in a stranger’s yard with her dad. A magical memory, one she can pull from the depths when, at 49 or 54, she’s unable to sleep one night, wondering how to pay the college tuition bill and pondering other exigencies that cause a middle-aged person to reflect on life and choices. A memory to smooth the coming bumps. After hearing about that post, Gabe’s wife Jennifer had a poetry post built in their yard as a birthday gift for him. Gabe admitted he was, and then Frank revealed he and his wife had put the very first poem in, while Gabe was away on a trip. They had seen the new poetry post, still empty, and typed up the poem, “A Man is a Success,” that had been on the back of Frank’s dad’s funeral card. Someone had swiped the poem out of the box soon after, and both Gabe and Frank agreed that taking a poem from a poetry box was a fine thing. Tony changes the poems every few weeks and, like Gabe, focuses on Portland and Oregon poets with his own poems added to the mix at times. ﻿﻿The posts have a couple of nuclei: one in Northeast Portland, around Grant Park, and another in Southeast, on Mount Tabor. Matt Blair, a Portland programmer, is close to finishing an iPhone app that reveals the location of many Portland poetry posts. The app is being developed in response to the City of Portland’s Civic Apps for Greater Portland contest to use public data to create user-friendly content. Matt’s Heritage Tree app won a Civic Apps award; it’s available free in the iTunes store. The poetry post app will be interactive, so walkers encountering an unmapped post can photograph it and add its image and address to the universe of posts. Matt was approached by fellow Portlander Sue Gemmell, whose interest in mobile technology, communities and culture inspired her to start the Portland Poetry Box Google Group as a virtual gathering place for people to share ideas about poetry posts. Before Sue talked to Matt about her idea for a poetry post app, he says, "I hadn't even seen one; I didn’t even know it was a phenomenon that existed in Portland.” But he must have been the right man for the job, because even while talking on the phone about what he loves about the posts, Matt crafts little nuggets of distilled imagery. Some posts are built by the homeowners but two Portlanders will build them to suit: Doug Trotter and John Milliken. Click here for a gallery of his posts. Very interesting post, thank you for sharing with us.